The letter was handwritten originally as shown at top left. I’m Liu Xia, citizen of the People’s Republic of China. I have been placed under house arrest in my own home since October, 2010. That deprives me of my personal freedom. However, no one has told me why I have been subjected to house arrest. Thinking about it over and over again, I conclude that, in this country, it must be a “crime” to be the wife of Liu Xiaobo. 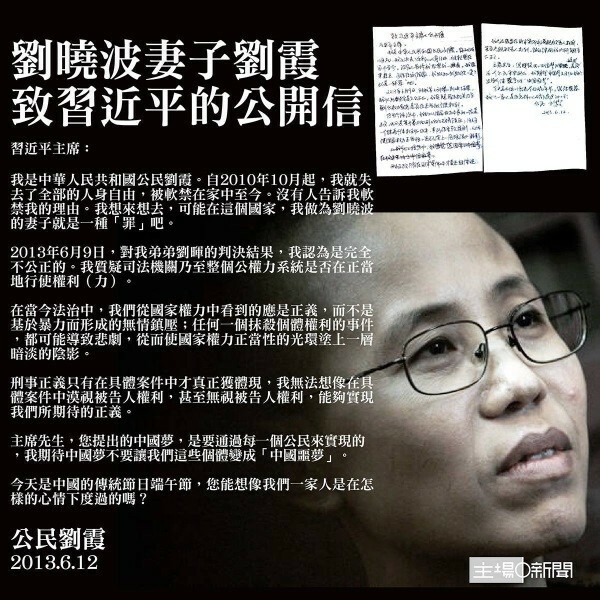 I believe the sentence handed down to my brother Liu Hui on June 9th, 2013, is completely unjust. I question whether the judiciary, even the entire apparatus of state power, is being misused. With the rule of law of our time, the state ought to be working to deliver justice, not to ruthlessly suppress people with the aid of violence. Any incident in which individual rights are denied can lead to tragedy, casting a dark shadow over the legitimacy of state power. Criminal justice can be manifest only through individual cases. I cannot imagine how we can expect justice when the rights of a defendant are circumvented, or disregarded altogether, in any given case. Mr. President, the Chinese dream you have proclaimed has to be a dream for each and every Chinese citizen to seek and to realize. I hope it will not turn into a “Chinese nightmare” for some citizens like myself. Today is the traditional Dragon Boat Festival. Can you envision how my family feels as we spend this Chinese holiday? By China Change in Human Rights & Civil Rights, Reports, Rule of Law on June 15, 2013 .